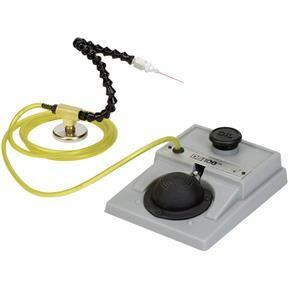 Step into the future of hands-free lubrication with the Cobra Fluid Dispensing System. This fully adjustable, foot-controlled system holds a pint of lubricating fluid and requires no compressed air or electricity. Perfect for milling, drilling, tapping or cutting, this portable system features a 7-foot supply line, flexible magnetic-base needle dispenser and five replaceable nozzle tips. Toss out that leaky oil can!